Marcy Stonikas will sing the title role at our final performance of Tosca this Saturday, January 24. Ausrine Stundyte, who sang on opening night and on Wednesday, January 14, has withdrawn from the production after not recovering from a cold. Stundyte was originally scheduled to share the role with Mary Elizabeth Williams, who sang her own scheduled performance on January 11 as well as the broadcast performance last Saturday, January 17, and last night's show, January 21. Williams will also sing tomorrow, Friday, January 23, as scheduled. Williams returns to Seattle Opera twice next year: as Abigaille in Nabucco and as Queen Elizabeth in Mary Stuart. 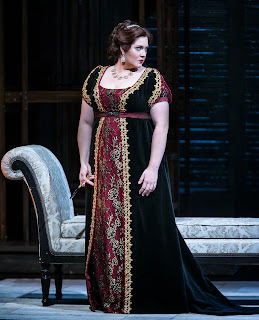 Stonikas gave Seattle Opera riveting mainstage performances of Turandot and Leonore in Fidelio in 2012 as well as Magda Sorel in The Consul in 2014. Prior to those performances Stonikas sang Tosca in an Opera Santa Barbara production directed by Josemaria Condemi, who also staged Seattle Opera's current production. She sings Fidelio in Vienna in March and Turandot in Cincinnati in July. The Chicago-born soprano is scheduled to return to Seattle as Ariadne in May’s production of Ariadne auf Naxos, a role she will share with Christiane Libor. Seattle Opera engages two casts for major roles, so that the company can present back-to-back performances such as this weekend’s Friday and Saturday. Leading roles, like Tosca and Ariadne, are so vocally demanding the singers need at least a day off between performances. Best wishes for a speedy recovery for Ausrine Stundyte, whose riveting opening night performance received strong reviews. And many thanks to Mary Elizabeth Williams and Marcy Stonikas--both graduates of Seattle Opera's Young Artists Program--for their professionalism as well as their incredible voices.